The tradition of telling stories in song goes back centuries in the form of broadsides and ballads. Topics included love, religion, drinking, legends, and early journalism, which is how information about di­sasters, political events, wonders and prodigies was spread or learned. These songs were sung and listened to by villagers and kings. Here is a delightful collection of songs that tell stories. 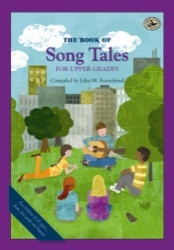 This collection is intended for older students who might enjoy hearing the songs sung by their teacher, or who might enjoy singing the songs themselves; a perfect follow up to The Book of Children’s SongTales. These SongTales are organized by subject matter - Great Places; Life, Love, and Happy Endings; Life, Love, and Sad Endings; Other Humorous Songs; Sea Songs; and Work Songs and Life. This beautifully illustrated collection is perfect for anyone who wants to pass on the tradition of telling stories in song.